One of the great features of the LG Ductless system is its ease of installation. A qualified contractor can usually install it in about a day. (Do-it-Yourselfers - Learn how to select a qualified contractor to install the system you select). There is little to no ductwork required so you don't have to worry about a disorder in your home interrupting your life or costly remodeling expenses. 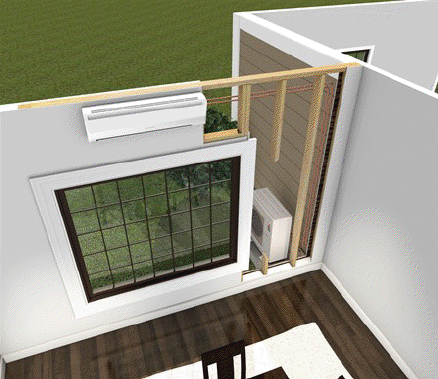 The sleek, ductless indoor unit mounts discreetly within the space, and a pair of small refrigerant lines plus power and control wiring, connect it to the outdoor unit through a small three-inch opening in the wall. Wall mounted - Mount on an exterior wall for ease of installation. Requires only a 3" hole in the wall for refrigerant and drain piping. Choose from 9,000 or 12,000 Btu options. Advanced air filtration means no expensive filters to buy or replace, just pristine air 24/7. Ceiling Cassette - When installed, the flush-mounted grille is all you see. With its fresh air intake capability and four-way discharge airflow, the ceiling cassette gives you plenty of fresh, comfortable air. Built-in condensate removal pump is included. You'll need about a foot of area above the ceiling.